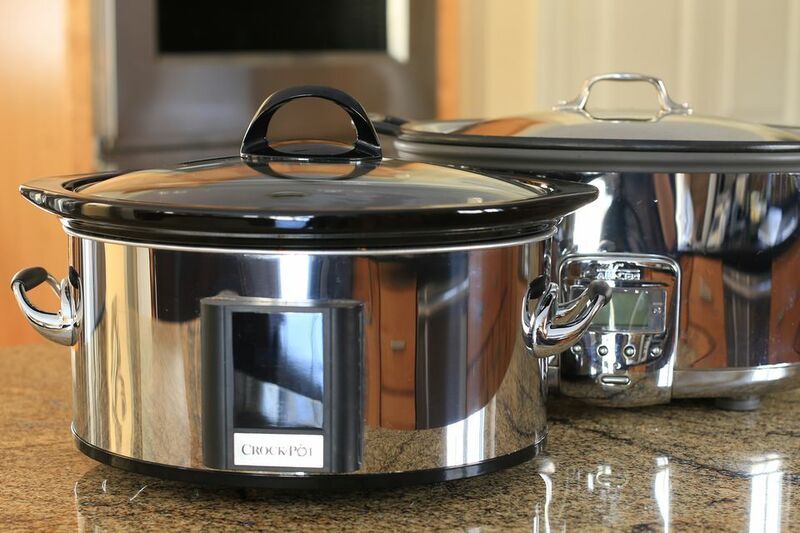 Slow cookers come in a variety of shapes and sizes, and if you use it regularly, you might find you want 2 or 3 different models. Popular sizes are 3 1/2-, 4-, and 5-quart models, but many larger and even smaller models are available. An extra small 1 to 2-quart models is ideal for party dips or very small cooking tasks. If you're cooking for yourself or for only two people, a 2 1/2- to 3 1/2-quart slow cooker might be large enough. The 3 1/2- to 4-quart size pots are big enough for many kinds of soup, stewed dishes, and casseroles. You might want a 5- to 7-quart model if you have a large family or plan to use it for larger dishes like pulled pork or roasts. What will you cook in your slow cooker? The larger round and oval sizes have the advantage of being able to accommodate a smaller casserole or souffle dish, springform pan, small round baking pan, or a small rack to place a roast on. Manufacturers recommend filling a slow cooker at least half full and no more than two-thirds full. Though the overall quality might not be affected, your dish might cook more quickly if filled less than half full, and if over-filled, it will take longer to heat up to temperature and cook. If you like to cook for potluck dinners and parties, you might find the larger 6- or 7-quart pots convenient. Some slow cookers are made with clips for the lids, insulated bags, and carrying handles. There are also slow cookers with metal cooking inserts that can be used on the stovetop or in the oven. That's a convenience if you like to saute or brown meats and vegetables before adding them to the slow cooker. It can also give the meal a head start. You can get the contents up to a simmer before starting the slow cooking process. If you like the all-in-one type of cooking, there are several on the market that can cook rice, slow cook, saute, and steam. And there are some that can be a pressure cooker or slow cooker. The popular Instant Pot is a great example of a pot that acts as a slow cooker or pressure cooker, and it can saute, steam, saute, and keep food warm.